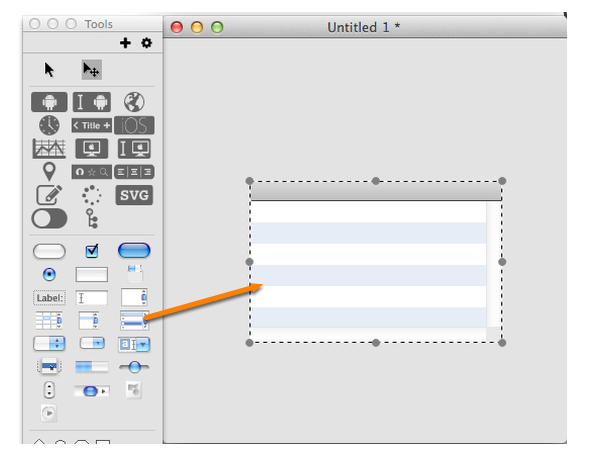 Create a new stack and drag a data grid from the Tools Palette onto the card. The database table that we will query has two fields that we are going to display. One is called firstname and the other lastname. 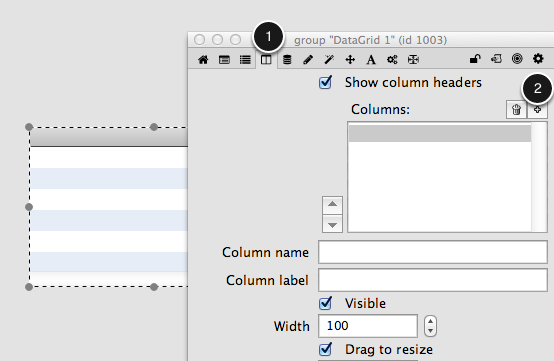 We will create two columns with the same name in the data grid. 1) With the data grid selected open the Property Inspector and switch to the Columns pane. 2) Click the + button to add a new column. Name the column firstname. Click the + button again and name the second column lastname. 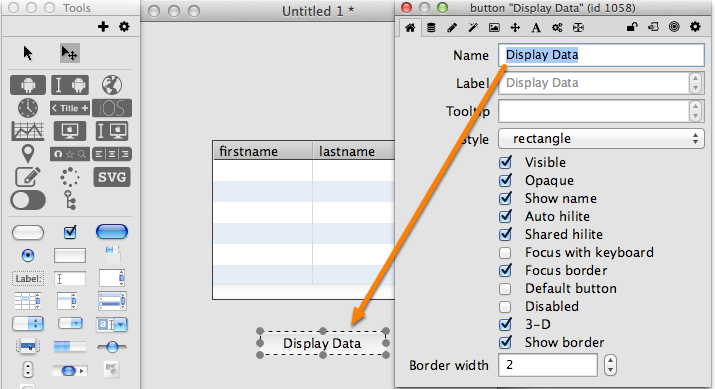 Now drag a button onto the card and name it Display Data using the Properties Palette. Right-click on the button and select Edit Script from the contextual menu. Now we are ready to connect to and query the LiveCode example database and display some data. To open a connection to a database you call revOpenDatabase. Let's begin with the following script in the button. answer "Error connecting to the database:" && theConnectionID & "." At this point the script has connected to the database and asked for all of the data in table Table1. But how do we display the data the database returned in the data grid? revQueryDatabase returns an integer that represents a database cursor and you can only assign arrays and text to a data grid. Converting a database cursor to an array is pretty straightforward. Here is a handler you can use for that very purpose. Now that we have the conversion handler we can update the button script accordingly. Copy, paste and compile the following script into the button. ## The cursor was successfully converted to an array. ## in the data grid. 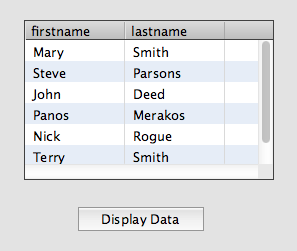 Now when you click on the Display Data button the records from the database table will be displayed in the data grid. Prev: How do I Create and set up a Database? I have just tried this and nothing happens - nothing is displayed in the datagrid. I have downloaded the stack just incase I did something wrong and this does not work. The example code wasn't reporting connection errors and it seems the example database isn't working at the moment. I'll update the code to display the error and try and figure out why we can't connect. The example db is up and running again and I have updated the example code with error reporting and the new example database name. Everything should function now. I cut and pasted the code, and all I got was the last name, not the first name. I also could not find the j which was refrenced in the local. Is that loop missing from the array? @markus: I just tested the code in a fresh stack and it worked as expected. 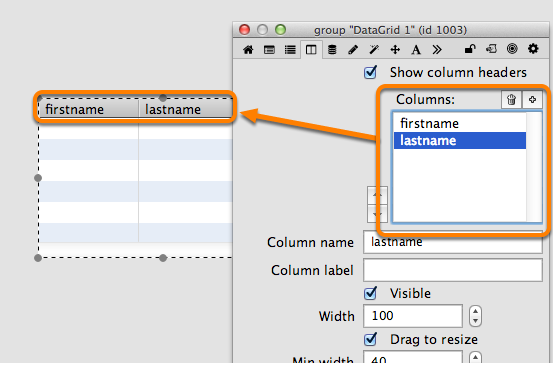 Check the column name in the Data Grid and make sure it is "firstname". "j" is not actually used. I have removed it from the sample script. This sort of works but the text in the cursor is truncated to the first character only. I can't look into the cursor through the variable value viewer - it just shows an integer. Should be two text columns with multiple rows. but using your code the rowid column sometime appears empty, why? @MaxV - I'm not sure why that would be. Some suggestions off the top of my head - is rowid present for some rows in the same cursor but not others? Or is it empty for all rows? If it is empty for all rows then in the ConvertSQLCursorToArray you should check that rowid is being returned in the list of fields returned by revDatabaseColumnNames. If not then that would be the problem. @ken - If the text is being truncated then that would be an issue with revDB and not the code in this article. You should probably put together a very basic test. If you run into problems then I would suggest asking around on the mailing list or forums. So how would update a row in the datagrid using this same way that you illustrated? Spend the last 3 hours trying to update a row to my own mysql database with no luck. How? You would query your database to get the new data and then update the data grid row using the method described in the article. and then converted the data to an array using split. Is there an advantage to using a cursor instead? @Paul - Using revDataFromQuery and storing the result as an array can take a really long time for large data sets. The cursor allows you to display the results from the query much faster. Plus, the large data set is being managed by the database. Hi.How can I integrate an encoding for UTF-8 ( used by SQLite ) to Unicode ( used in DataGrid )? put textDecode(tDBData,"UTF8") into field "name"
hye. may i know how to display data in next stack after fill the textfield. only display that data once we key in to the database. i hope you can replay my msg as soon as possible. Hi Nurul Amira, I'm sorry but I'm not quite clear on what you want to achieve. Can you clarify?